The Hudson-Bergen Light was extended to Hoboken Terminal on September 29, 2002, and is a stub-end terminal with trains ending at bumper blocks along the Hudson River. 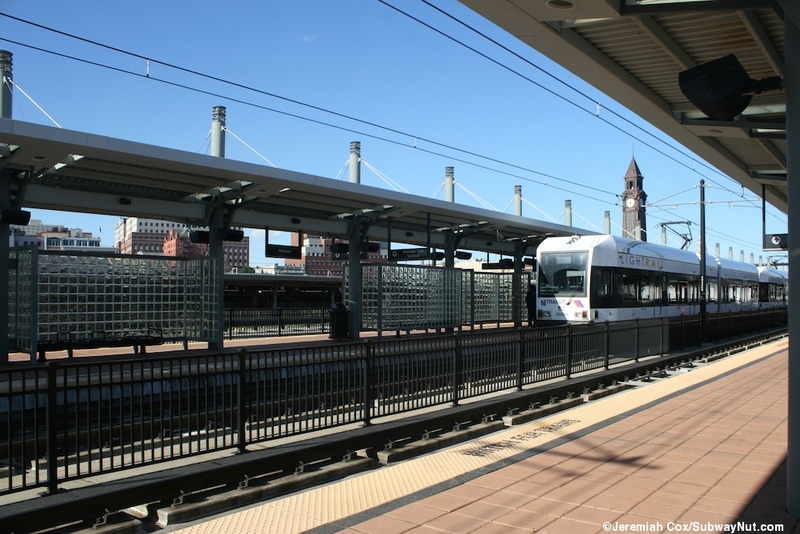 Beginning in September 7, 2004 with the opening of the first phase of the northern extension to Lincoln Harbor it became the terminus of all 3 HBLR routes, and connecting point between shuttle LRVs to Lincoln Harbor and the two main southbound services. 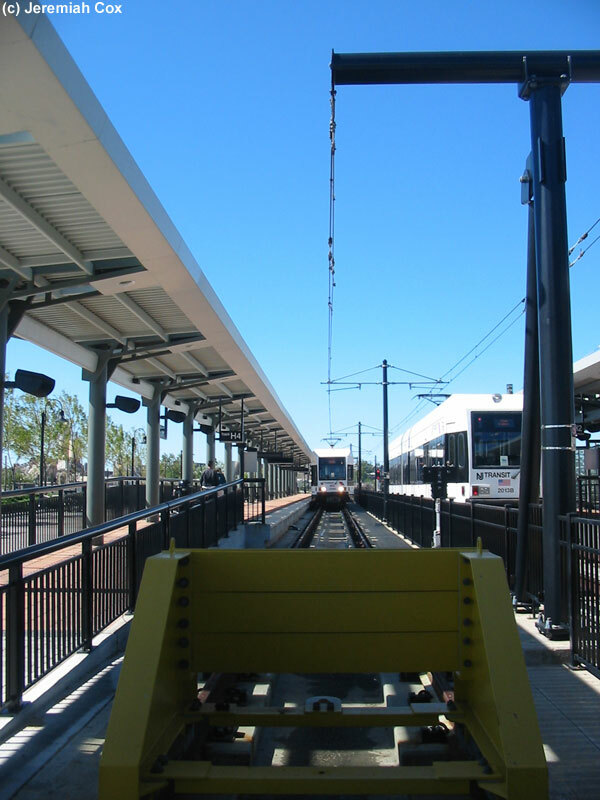 On February 11, 2006, West Side Avenue trains were rerouted to Lincoln Harbor in preparation of the February 25, 2006 opening to Tonnelle Avenue. 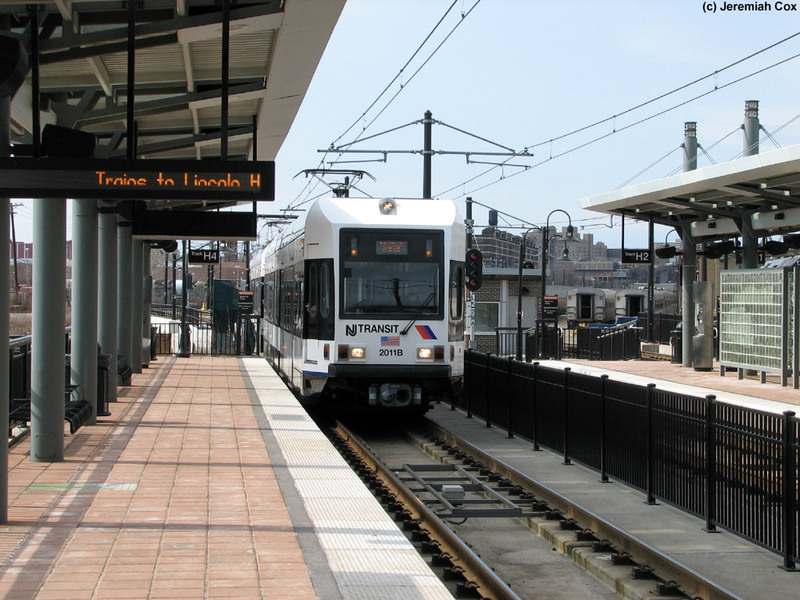 This service pattern continues to this day with Hoboken serving as the terminus of single LRVs heading northbound to Tonnelle Avenue and two car LRVs heading southbound to 8th Street in Bayonne. 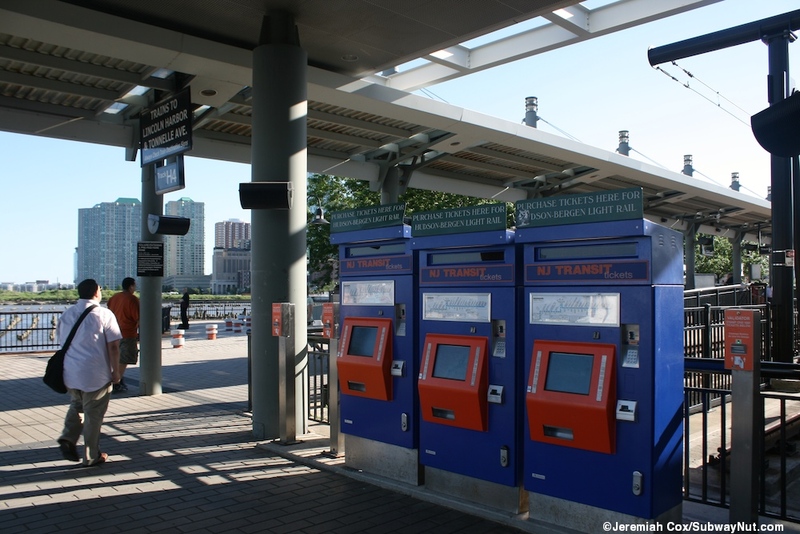 Passengers heading from Hoboken to the 3 stations only served by West Side Avenue trains now have to transfer at any of the stops before Liberty State Park. 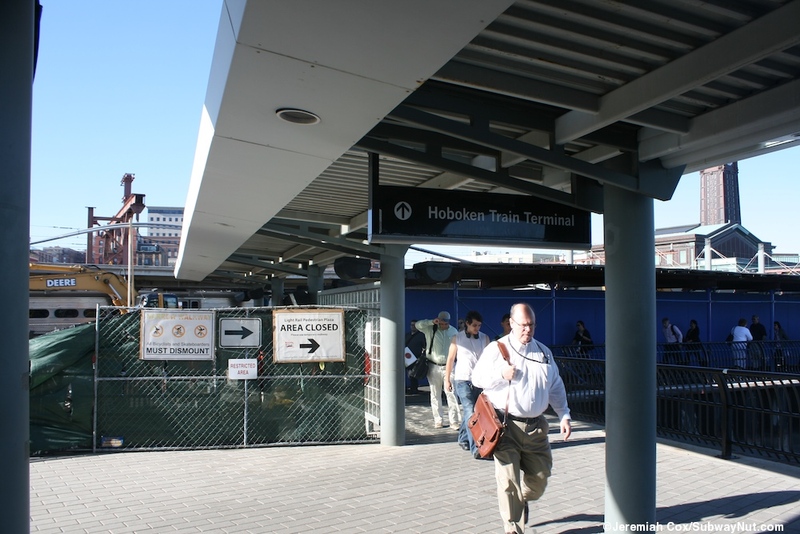 On August 28, 2010 the HBLR underwent a series of service cuts that discontinued the Tonnelle Avenue — Hoboken Terminal route on weekends. 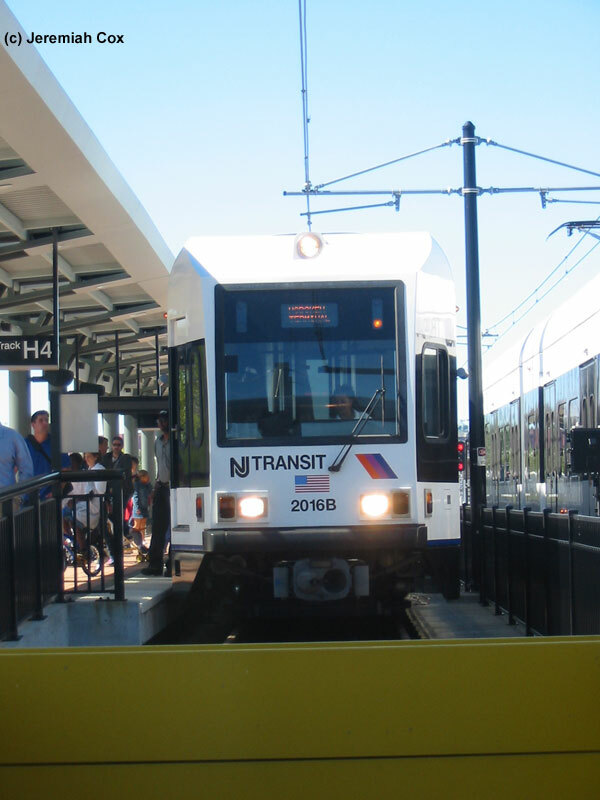 Weekend service today is only from trains to Bayonne (running every 20 minutes) and passengers must take this train one stop south to Pavonia/Newport to transfer to trains on the West Side Avenue — Tonnelle Avenue route to head north. 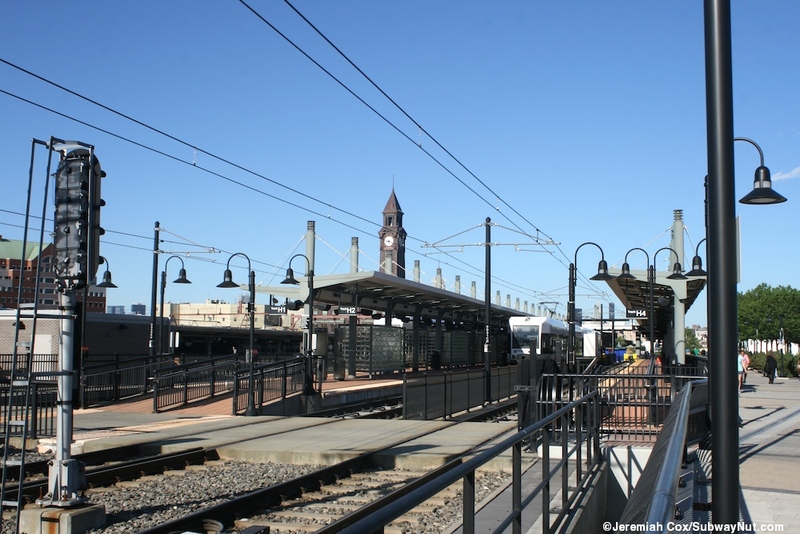 The station is located at the southern edge of the Hoboken Terminal complex. The end of the short platforms much farther back than the heavy rail platforms. Just south of the platforms is the Waterfront Walkway that goes through the rail terminal and opened a continuous connection south to Newport in 2009. 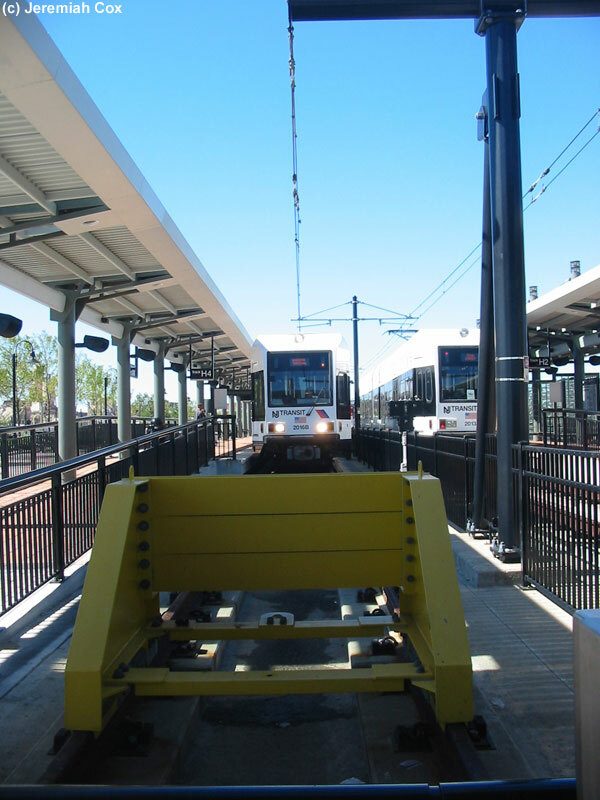 The light rail terminal has three tracks for trains, H1 and H2 are the north tracks and share an island platform. This platform has a number of glass windscreens in the middle of it, providing shelter for the benches in the middle of it. 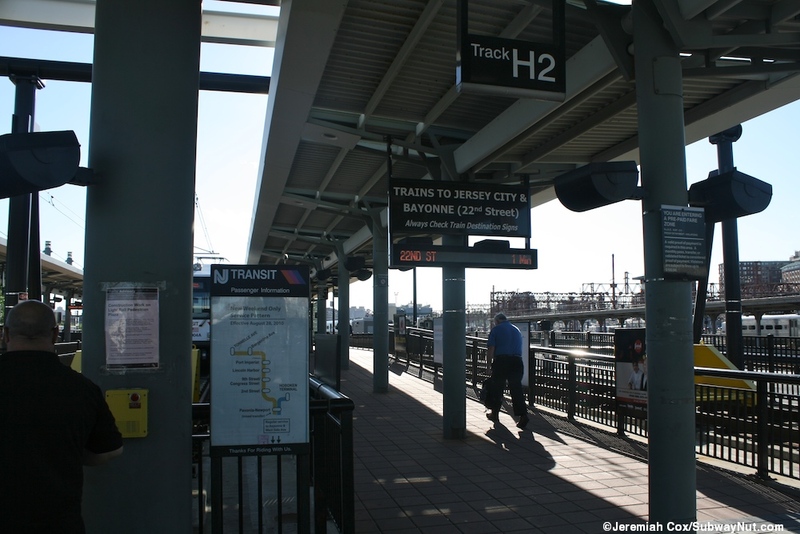 It is normally used by southbound trains to Bayonne and has a permanent sign: "Trains to Jersey City & Bayonne (22 Street)" (as of 2013 the signs haven't been updated for the two-year old extension). 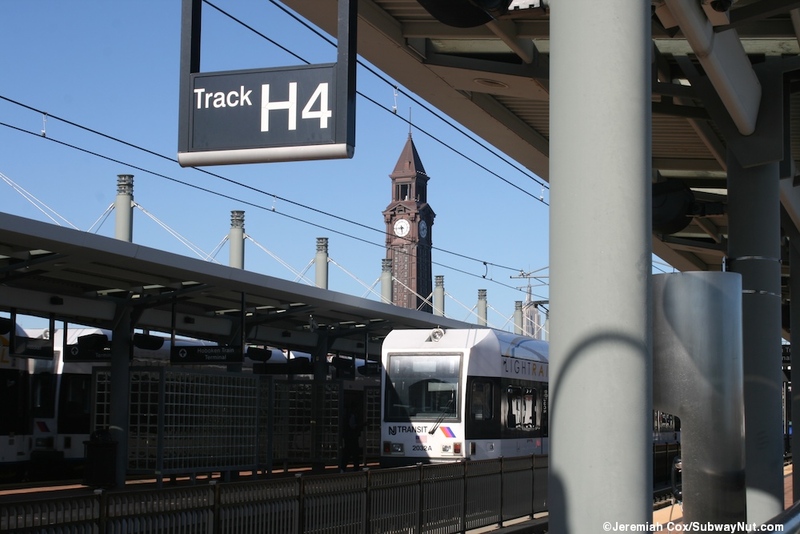 Track H4 is the southernmost track of the entire station complex and has a side platform for northbound trains: 'Lincoln Harbor & Tonnelle Avenue', beneath both destinations is a reminder to Always Check Train Destination Signs. This side platform has no benches for waiting passengers just a fence to separate it from the promenade along it. The only legal way to access both platforms is by going down the short ramps off them beyond their bumper blocks. This leads to an entrance area where the HBLR TVMs are. The platforms are fare paid zone. The platforms have closed ramps (by fencing) down at their western ends to a closed pedestrian grade crossing. 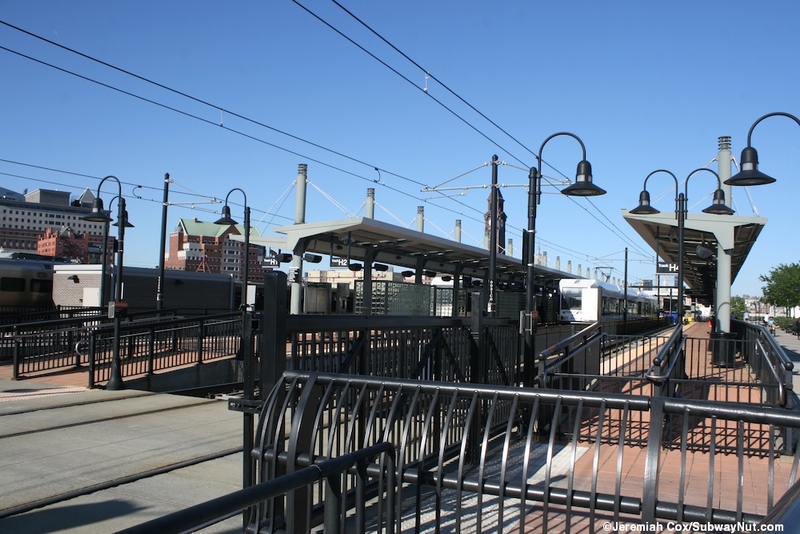 The entire length of both platforms and exit ramps is covered by a modern light green canopy structure. 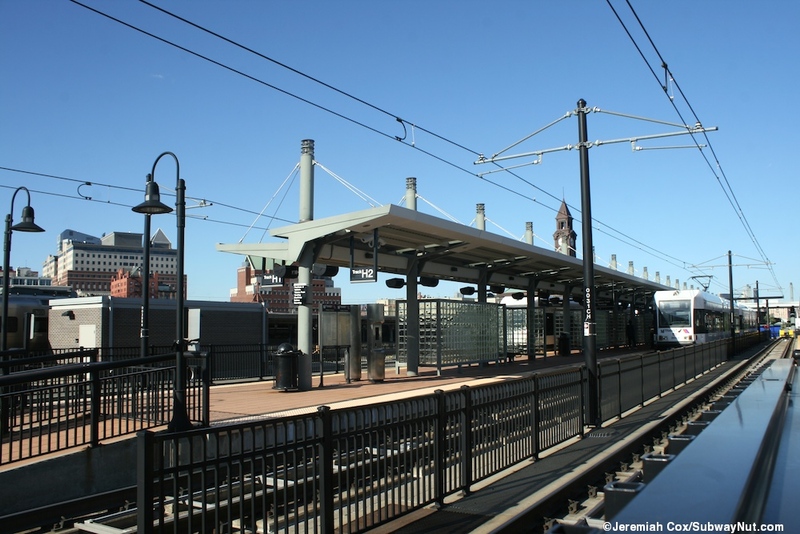 This structure has a series of green support beams that extend above the line of the canopy and metal crossbeams suspend the awning down from it, and extends all the way beyond the platforms (coving the TVMs) and over a portion of the Hudson River Light Rail Plaza all the way to the edge of the historic Bush Train Shed. 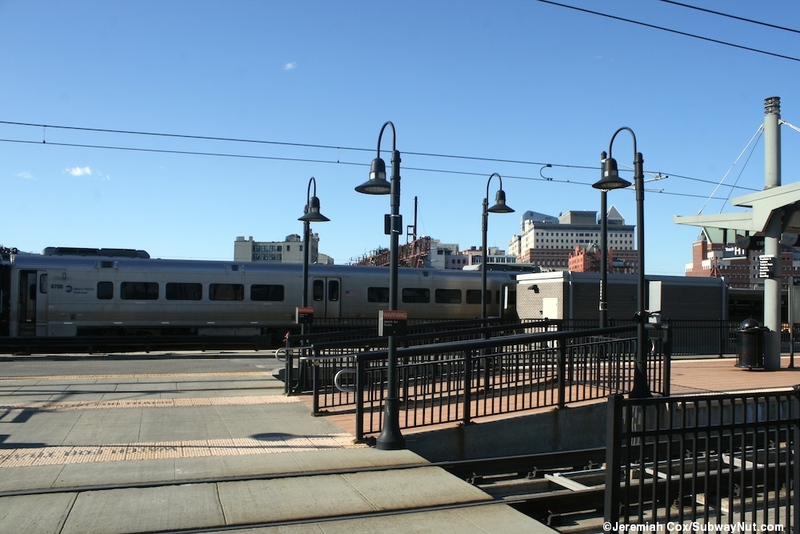 This allows passengers a completely covered transfer from the HBLR to Main Line NJ Transit Trains, PATH, or New York Waterway Ferries and even buses on the north side of the terminal complex. The base of this walkway has colorful mosaics by Judith Wadia. This covered walkway is quite long because the HLBR platforms don't extend all the way to the edge of the terminal. 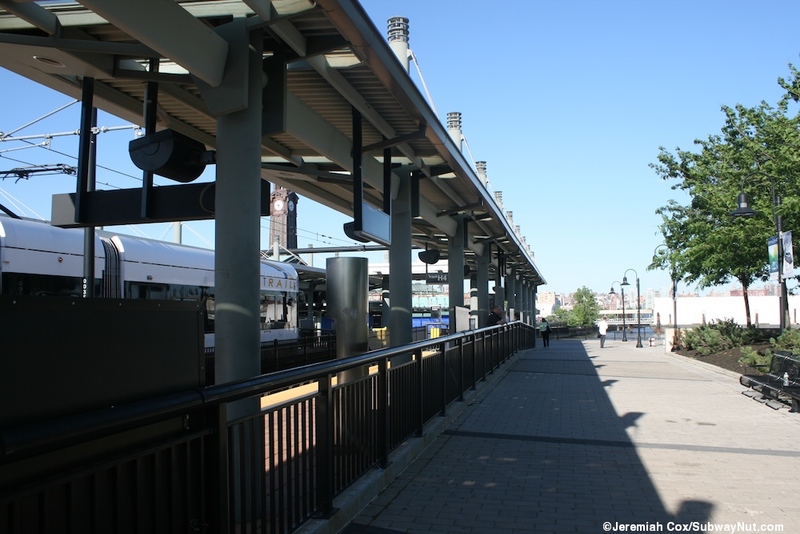 The Hudson-Bergen Light Rail Plaza is along the southern edge of the rail platforms built on fill along the Hudson River. There are various benches and plantains and also Hoboken Transfer by George Mossman Greenmyer along the side near the water. This sculpture is two supports holding up a black beam. On the center of the beam is a representation of the train/ferry station with the iconic clock tower. At one end is a ferry boat (Montclair), and passengers holding a banner with Excelsior (the state motto of New York) the other end a D.L.&W. steam locomotive and a banner for Liberty and Prosperity. This piece of artwork is also a remembrance to the Pullman Immigrant Building located at the end of the plaza just before the main terminal. This building is now used for employees but was once used for new immigrants into Hoboken, many of these travelers were undoubtedly just passing through New York and immediately boarded trains at Hoboken or the other Jersey Rail Terminals to futures in other places throughout the United States. 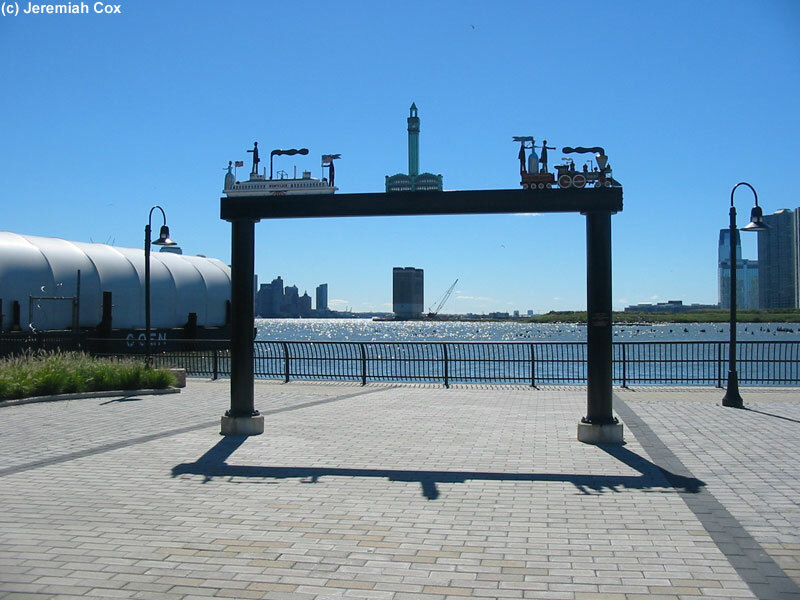 Finally nearby on the edge of the Hudson are a set of Bollards, by Livio Sagaanic. These are extremely low bollards in some of the plaza space near the platform. 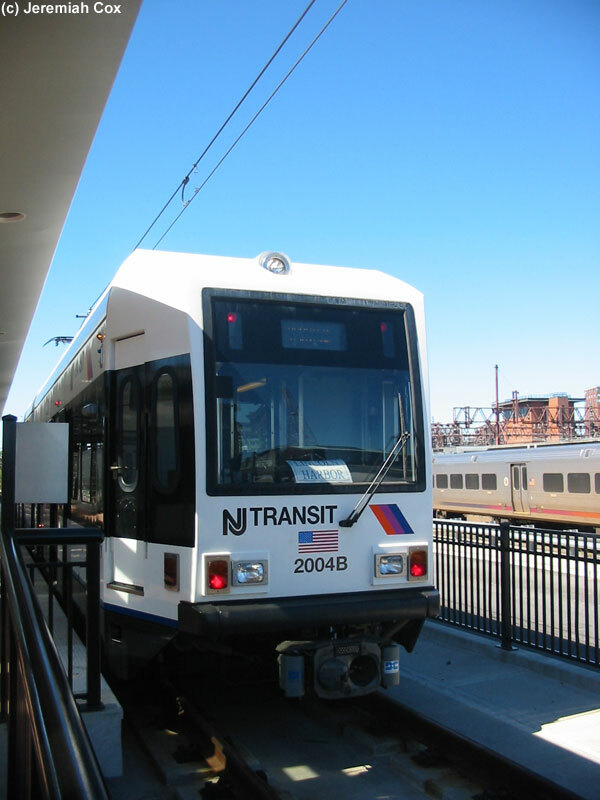 NJ LRV #2004B on shuttle train duty to Lincoln Harbor at Hoboken. 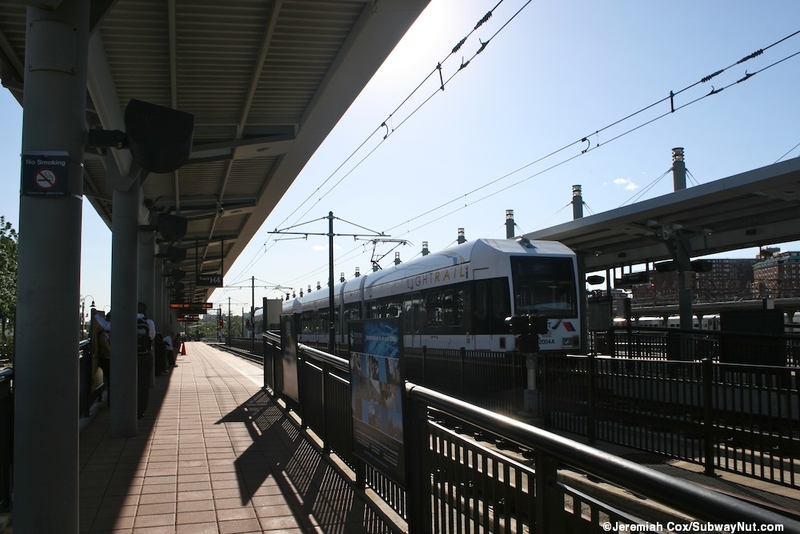 Notice a typed written sign in the window saying Lincoln Harbor, the stations on this new short branch have not been programmed into the cars yet. A decorative entrance archway with figures of a boat station and train, documenting Hoboken Station's importance before underwater tunnels could be built. A terminating train enters Hoboken. A terminating train enters Hoboken a little closer. 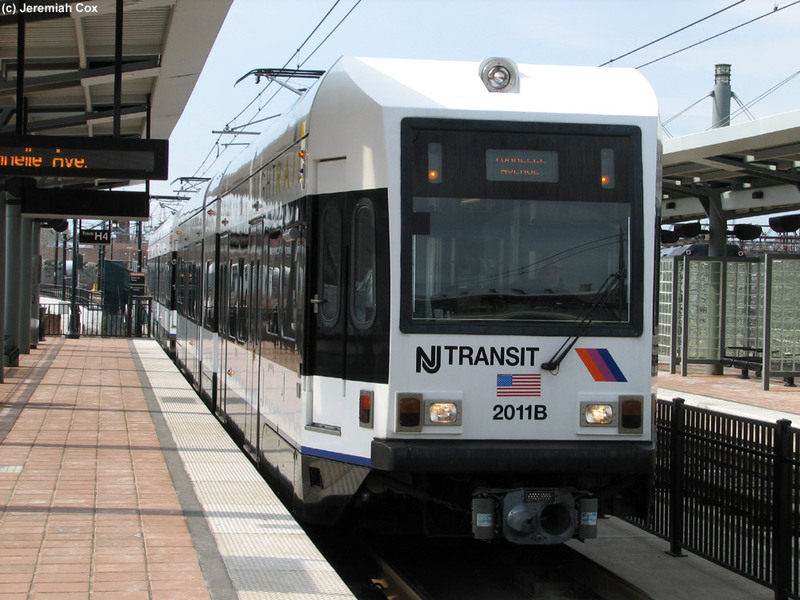 NJ LRV #2016B Terminates at Hoboken. 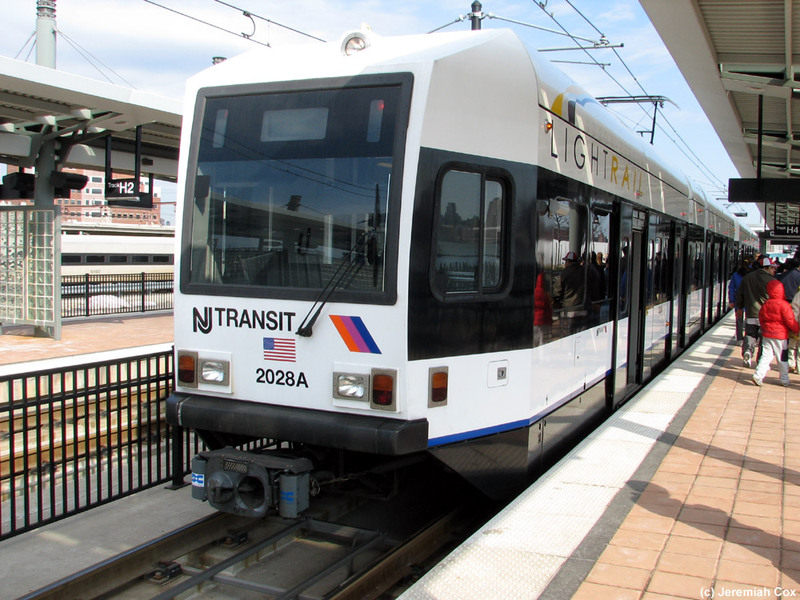 NJ LRV #2011B enters Hoboken on a rare opening day only two car train coming from Tonnelle Avenue to Terminate. 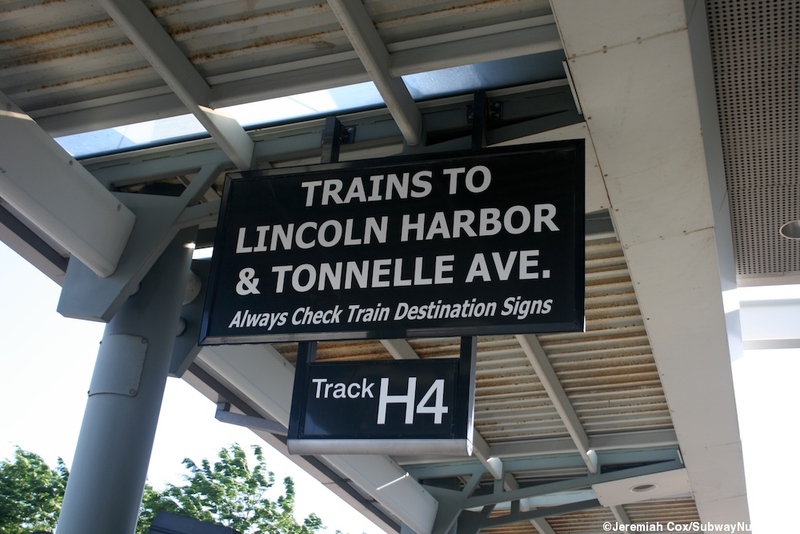 Sign for Trains to Lincoln Harbor and Tonnelle Ave.